“Living here, you become part of the farm. 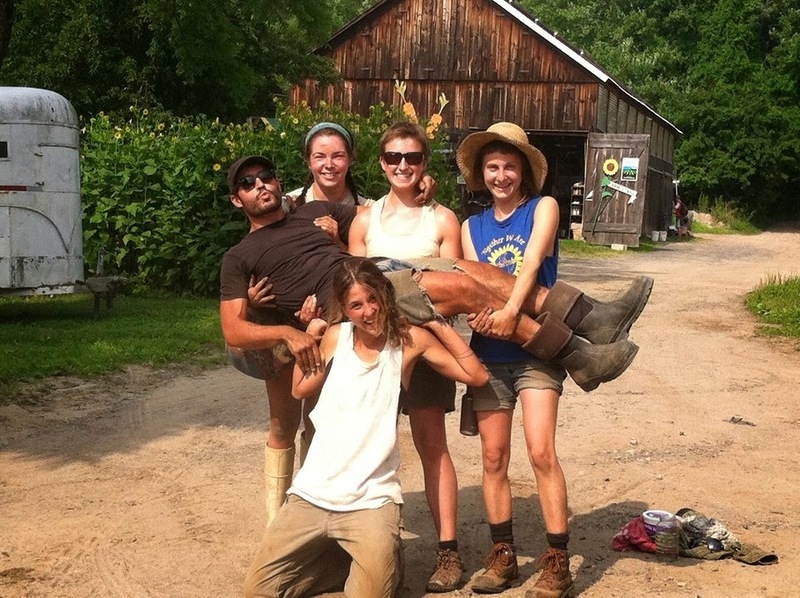 Everything that goes wrong, and everything that goes right, is part of you.” This is how Jerahmy Parsons describes the apprenticeship experience at Simple Gifts Farm. Gosh, I thought to myself, that sounds rather overwhelming. So I asked what he thought of such a full immersion. Jerahmy Parsons is absorbed in farming, one piece of reaching his ambition to become a wine maker. Understanding crop production and how to work with the soil to produce a crop – potatoes, squash, or wine grapes – is critical to growing quality vegetables and wine alike. Wine, of course, gets plenty of attention for its ‘terroir,’ but think about New England strawberries in June, or the earthy sweetness of new potatoes in your share. Arriving in Amherst in 2005 for college, Jerahmy earned a degree in chemistry from University of Massachusetts. He enjoyed studying chemistry, although his original thought to prepare for medical school was turned on its head when he studied abroad in Paris, and became enamored of wine culture. On return, he began taking food chemistry and soils courses, and got a job at Spirit Haus, where he continues to work part-time. We met Jerahmy in 2012, when he volunteered at the farm in exchange for a CSA share. He returned this year to join the apprenticeship program, and has found the experience to be wildly different. Working part time, you get a partial understanding of how the farm works. An apprentice participates in the full process, and has the commitment and time to learn new skills. For example, Jerahmy didn’t know the first thing about driving tractor, and now he is one of our go-to people for tractor jobs. Full-time farming allows you to observe, and to discover how the farm is showing you what is going well and what needs attention. He had worked at a smaller vegetable farm the year before, and was interested in Simple Gifts’ larger scale, and how we integrate livestock into our long-term soil management. He has enjoyed getting to know the animals and how to interact with them. He’s found that with animals, love goes a long way. As for a favorite vegetable, it has everything to do with the time and place. The first of each crop as it comes in, is the best to him. Giving Jerahmy a send-off to California wine country! Last year, he headed to wine country – Sonoma County in California – to work for Ramey Wine Cellars and learn about the wine-making process. He didn’t work in the vineyards, but participated in every step from receiving the grapes to the finished wine. Jerahmy is heading back across the country in a few days for the 2014 wine-making season. We will miss his hard work and one-handed pull-ups, but wish him well in pursuing his wine-making dream. And who knows? Perhaps wine-making in Amherst is in his future. Jerahmy has already circled back here three times, and with a warming climate, Amherst may become a fine wine-growing region.